There has for many years been considerable concern that there may be insufficient competition within the UK banking and related sectors. The 2008 financial crisis then led to concern about the banks' resilience in the face of market turmoil. This web page focusses on these two issues. There have been several examples of the failure of regulation to deter bad behaviour, not least in the run up to the 2008 financial crisis. Some banks even facilitated widespread tax avoidance. It is accordingly interesting to consider the regulation of large organisations such as banks. It is also useful to look at regulators themselves so as to understand the causes of the persistently weak regulation which allowed such failures to occur. One of the causes of weak regulation was political support for light touch regulation which compromised the independence of regulators. It has also been pointed out that the Financial Services Authority was probably simply too big so that its Board was out of touch with its day-to-day enforcement activities. The authority (and its successors) may also have relied too heavily on ex post (after the event) punishment of transgressions rather than ex ante deterrence. This issue is discussed here. The NAO have also published a good guide to financial services regulation. Back in the 1980s, the Thatcher Government legislated for the Big Bang which transformed the City of London by ending fixed commission charges and breaking down barriers between market makers and traders, so heralding the advent of US-style investment banking in London. One of the key supporters of this policy, John Redwood, described the old cliques that used to dominate the City as "knights in a castle, feasting, jousting and pillaging at the expense of the peasants who live outside". Following the Big Bang, the knights would lower the drawbridge and allow the peasants to share the wealth being generated. Subsequent over-weak regulation unfortunately merely allowed one set of knights - thousands of millionaire bankers - to replace the old City clique. But the sector hardly escaped regulatory attention. Significant Competition Commission (CC) inquiries into the retail banking sector include that into the proposed merger between Lloyds Bank and Abbey National (for which the CC refused permission) and market investigations into SME banking, current account banking in Northern Ireland, and the sale of Payment Protection Insurance (for both of which the CC imposed 'remedies' aimed at improving the functioning of those markets). Many other investigations have been carried out by the OFT and the European Commission. (Box 3 within the Issues paper published by the Independent Commission on Banking listed 24 investigations from 2000 - see below for further information about the Banking Commission.) But it was well recognised that these investigations were merely examining discrete elements of an industry which appeared to have widespread competition problems, whether evidenced by its high profitability, its high salaries and bonuses, or its apparent disdain for its customers, itself evidenced by mis-selling and/or poor service quality. None of these things are by themselves conclusive evidence of weak competition, but you would expect them to be competed away over time as companies fight to gain market share by cutting prices or treating their customers better - but this was simply not happening. The obvious response was to begin a wide ranging market investigation, but experts agreed that the industry was just too big and too complex for such an exercise to be able to reach appeal-proof conclusions within the statutory time limit of two years. And then there came the 2008 global financial crisis. As well as increasing the depth of concern about the extent of competition within the industry, the extent of competition was further reduced by the need to wave through the emergency acquisition of HBOS by Lloyds TSB on public interest grounds. Wise heads recognised that this decision would look less clever once the emergency had passed - as it did, including to Lloyds TSB shareholders - but there genuinely seemed no alternative at the time. Andrew Haldane, the Bank of England's Executive Director for Financial Stability, joined others when arguing, in March 2010, that the UK's banks should be broken up into smaller and more resilient units. The incoming Coalition Government elected in May 2010, then lost not time in establishing the Independent Commission on Banking in June 2010. The Commission was headed by Sir John Vickers, previously an impressive Head of the Office of Fair Trading and now Warden of All Souls College, Oxford. The Commission was asked to take a wide-ranging look at the structure of the UK banking sector, aimed at (a) making banks more resilient and/or more able to fail without undue distress to the wider economy, and (b) making the sector more competitive so that it serves its customers better. In particular, could steps be taken to remove the inducement to excessive risk-taking arising from the perception that some institutions are 'too big to fail' and therefore guaranteed by the public purse? The Commission was not to look at questions such as the adequacy of capital reserves, liquidity and macro-prudential regulation - i.e. measures intended to improve the stability and resilience of the financial system as a whole - e.g. resilience to cyclical developments. Activities undertaken by banks can be broadly divided into retail & commercial banking; and wholesale & investment banking. The 340 strong UK banking sector is relatively concentrated, compared with Germany (2,000 banks) and the US (8,000 banks). The retail/commercial banking sector is especially concentrated. The top 6 banks account for 88% of all retail deposits (cf. France 10 - 88%, Germany 7 - 68%, US 8- 35%). What matters is not competition per se but competition to provide what customers want. Where markets are not functioning well, suppliers may compete amongst themselves, but not necessarily in areas that customers care about. Possible distortions of incentives in financial services markets are (a) ill-informed choice by customers - leading to their being exploited,(b) mis-alignment of incentives between owners, creditors and managers of the firm - leading, for instance, to managers being unduly rewarded on the basis of short-term performance measures, and (c) implicit state guarantees - leading to excessive risk-taking. larger domestic banks should have a further systemic risk buffer - that is additional capital measured as a percentage of risk-weighted assets (RWAs). The Government accepted the first recommendation but, on the second, said that it intended to set the lending limit at 33 times capital so as to be more in line with international lending limits. 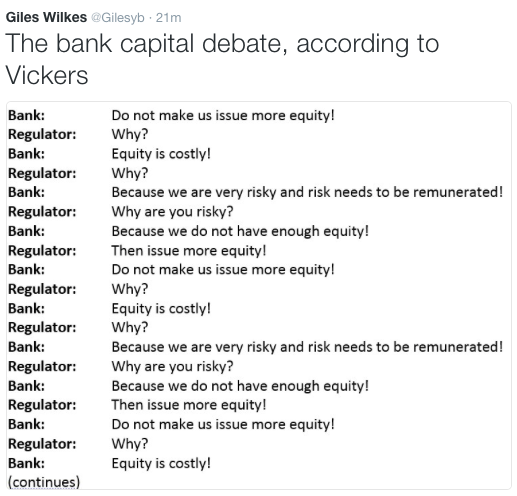 The debate on the systemic risk buffer continues and has been neatly summarised by Giles Wilkes - see box above right. The latest salvo from John Vickers, in May 2018, contained the charge that the British banking system still had "dangerously high" levels of leverage. It is certainly worrying that the debate has not been settled ten years on from the 2008 financial crisis, and maybe fewer from the next one. It is generally accepted that bankers' increasingly intricate risk models have failed to protect them or the public purse against financial disaster. Models are great if they are modelling stable and predictable, low risk systems, using large amounts of relevant data. But financial systems contain many risk factors and are unstable, globally connected, and poorly understood. Unfortunately, however, the financial great and good have resisted using simple rules of thumb and have instead drafted increasingly complex international agreements to regulate the capital needed by a bank so that it is unlikely to default. The first Basel Accord was 30 pages long. Basel III came to 616 pages which required 1000 pages of primary legislation in the USA alone. As noted above, Basel III can be boiled down, if you are brave, into a simple rule requiring a capital/borrowing ratio of (a bit less than) 1 to 33. The Independent Commission recommended (a bit less than) 1 to 25. Ex-Bank of England Governor Mervyn King was once asked which simple rules would reduce the danger of further banking crises. He replied with just one simple rule: 'Don't use leverage ratios above 1:10. The 2008 financial crisis had led the United States authorities to introduce the Volcker Rule which prevented banks from trading with depositors’ money. It was reported in 2018 that the Trump administration proposed loosening the rule so as to give banks more room for complex trades. In March 2014 the Competition and Markets Authority (CMA) announced a short programme of work on banking, which would lead to a decision on whether or not to make a market investigation reference to be conducted by a CMA panel of independent members. The CMA noted that 'Based on the OFT’s 2013 findings on personal current accounts and the work to date in the market study of SME banking, there appear to be important similarities between competition issues for personal current account customers and for SME customers'. A full market investigation was then announced in November 2014. The CMA published its Provisional Findings in November 2015. They were sensible and predictable, focusing on customers' ability to shop around, the impact of free-if-in-credit (FIIC) accounts, the level of concentration in the market (only a small number of large banks plus lots of smaller ones), and barriers to entry. Switching and searching rates were found to be low - and this activity was more prevalent amongst higher income customers. Overdraft customers were accordingly less likely to switch even though they had most to gain. Equally, banks competed less hard for such customers. The CMA accordingly concluded that the market concentration was not a problem, but that low customer engagement, switching etc led to Adverse Effects on Competition, which needed to be remedied. Banks will be forced to share customers' information with third parties to make it easier for them to find better deals. Customers will be able to manage all their accounts with different banks through a single app. Banks must cap unarranged overdraft charges and inform customers. They must send alerts to customers going into unarranged overdraft and inform them of a grace period to avoid charges. Banks must publish trustworthy and objective information on quality of service online and in branches. Banks must alert customers about the closure of a local branch or an increase in charges. Banks must fund the innovation charity Nesta to create comparison tools for small businesses. Reaction was mixed. Some - and especially the smaller challenger banks - thought that the CMA had 'missed a golden opportunity to shake up banking'. Others thought that the CMA was correct to trust modern price comparison technology, believing that tech-savvy customers would put the banks under much more competitive pressure once the necessary online and mobile tools were available. There was particular praise for the CMA's willingness to engage in remedy-trialling and to encourage prize funds to encourage the development of new technologies. The Open Banking elements of the CMA's remedies are being carried forward by the Open Banking Implementation Entity. Follow this link for a further discussion of switching and effective competition. Start with the issue of debt. Ten years ago, investors and financial institutions re-learnt the hard way that excess leverage can be dangerous. So it seemed natural to think that debt would decline, as chastened lenders and borrowers ran scared. Not so. The American mortgage market did experience deleveraging. So did the bank and hedge fund sectors. But overall global debt has surged: last year it was 217 per cent of gross domestic product, nearly 40 percentage points higher — not lower — than 2007. A second surprise is the size of banks. The knock-on effects of the Lehman bankruptcy made clear the dangers posed by “too big to fail” financial institutions with extreme concentrations of market power and risks. Unsurprisingly, there were calls to break them up. The big beasts are even bigger: at the last count America’s top five banks controlled 47 per cent of banking assets, compared with 44 per cent in 2007, and the top 1 per cent of mutual funds have 45 per cent of assets. A third counter-intuitive development is the relative power of American finance. In 2008, the crisis seemed to be a “made in America” saga: US subprime mortgages and Wall Street financial engineering were at the root of the meltdown. So it seemed natural to presume that American finance might be subsequently humbled. Not so. American investment banks today eclipse their European rivals in almost every sense (share of deals, return on equity and stock price performance), and the financial centres of New York and Chicago continue to swell as London is troubled by Brexit. Then there is the issue of non-bank financial companies. A decade ago, investors discovered the world of “shadow banks”, when they learnt that a vast hidden ecosystem of opaque investment vehicles posed systemic risks. Regulators pledged to clamp down. So did the shadow banks shrink? Not quite: a conservative definition of the shadow bank sector suggests that it is now $45tn in size, controlling 13 per cent of the world’s financial assets, up from $28tn in 2010. A regulatory clampdown on the banks has only pushed more activity to the shadows. A fifth issue to ponder is the post-crisis retribution. Back when lenders were falling over by the dozens, it seemed natural to presume that some bankers would end up in jail. After all, there were hundreds of prosecutions after the US savings and loans scandals of the 1980s. But while banks have been hit with fines in the past decade, totalling more than $321bn, (almost) the only financiers who have done jail time are those who committed crimes that were not directly linked to the crisis, such as traders who rigged the Libor rate. Now, cynics might say that these five surprises show just how powerful the financial elite remains in the west; they might argue ... that they also reflect a failure of those elites and would-be reformers, to propose alternative ideologies. But these developments can be explained by a sixth counter-intuitive change: what has happened in the political sphere. A decade ago, it seemed natural to expect that the crisis would lead to a resurgence of the political left. In 2009 the Occupy Wall Street movement initially gained support for its campaign against free market excess. But today it is largely rightwing parties that have grabbed the biggest electoral rewards. Even when these groups campaign under the mantle of anti-establishment rhetoric, they generally have limited interest in overhauling (or even talking about) the structure of finance." Professor Luis Garicano, writing in 2018, thought that a financial crisis could well happen again.